Productivity begins by creating business documents that are simple to understand, easy to transmit, and focus on your business goals. Our document creation solutions bring life to your business documents, giving you complete control over how they are presented and distributed. 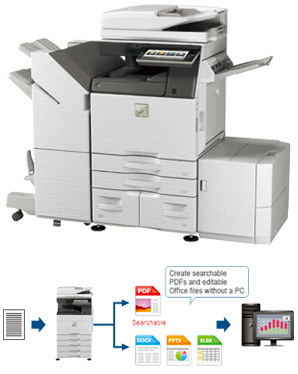 Your fleet of Copiers, Printers, and Multifunction Systems convert digital documents to paper format. You need print devices that are reliable, productive and cost effective. TBS in Houston brings you Sharp systems that print documents in black and white and full color. Multifunction Systems and Scanners provide powerful communication hubs that do more than print and copy. 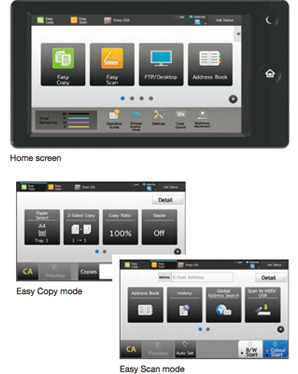 These systems provide a bridge between paper, digital and email documents to enhance your productivity. 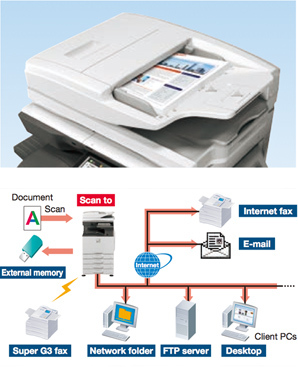 Documents can be scanned to email or network folders. Few things are more frustrating than needing information and not being able to get your hands on it. Our Document Management solutions allow you to access critical information quickly and securely. Typically, the final step in the process is delivery. Whether you want to fold, insert, meter and mail your documents or utilize an electronic method, TBS can help! The entire backend process is not efficient if you do not have a reliable and efficient delivery method to reach your end recipients. Documents drive business processes. We provide Houston-based businesses copier and document solutions that streamline the flow of information through your business, helping you maximize productivity and reduce costs. Multifunction Systems, Copiers, Printers and Scanners provide bridges between paper and digital worlds. TBS brings customized systems to the Houston market that streamline the way paper and digital information flows through your business. Technology requires support. TBS brings you on-site support combined with remote monitoring, cloud and backup services that improve productivity and peace of mind.